So you got a new telescope for the holidays: A Quick Primer for new telescope users. If you have a larger Equatorial mount keep in mind that you can use the setting circles to help find objects in the night sky with the help of a star atlas. But this means you have to learn to use it. Read your instruction manual carefully. 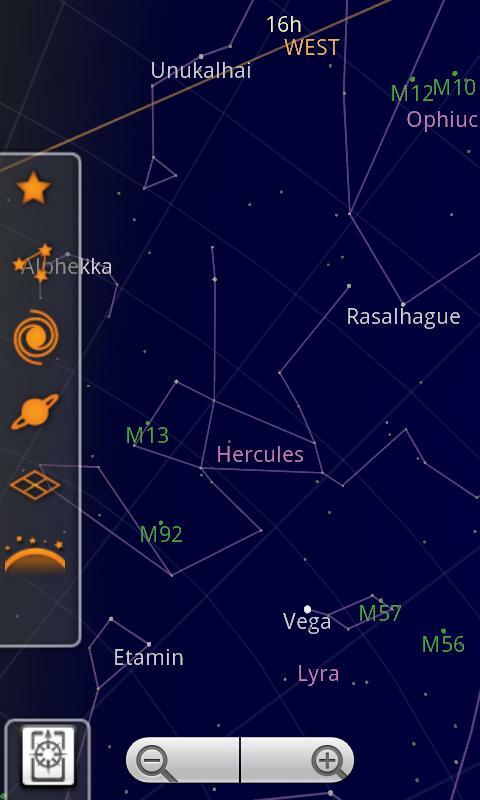 You might also consider downloading a Sidereal Time app for you smartphone. You’ll see why once you figure out the details of using your Equatorial mount. 6) Got a computerized telescope? Take advantage of free smartphone apps to make it much easier to set up! We’ve been kind of ‘meh’ about computerized telescopes in the past, and are still a bit wary of a telescope where 70% of the cost is in the computer and motors and not the optics. But we have softened a bit since they have become a bit easier to use – and not because they changed, but rather our phones did. Computerized telescope makers kind of make it seem like a computer means your telescope will magically find things in the night sky. All you need to do is toss it into your yard and enjoy the viewing. But that is not how they work. To set up the telescope’s computer you need to point it at two named stars so it can calculate where everything else in the night sky is located. This used to mean that to set up the telescope you had to have good knowledge of the night sky to find those stars -which kind of defeated the purpose. But now smartphones are ubiquitous these days and there are plenty of planetarium apps out there for free that will help you identify those stars. Smartphone planetarium apps are not super-accurate (they can be off by as much as an hour) but they will help you spot and identify bright stars that you need to aim your telescope at to orient the computer. This makes the computer orientation much easier to do than trying to learn to use a planisphere or star map on the fly. But this sort of thing is actually nothing new. In fact the history of Solar System astronomy from Galileo to the present day is riddled with odd controversies like naming conventions, egoism, nationalism, lost chances, new classifications & credit-stealing that have dogged the history of local astronomy. Here are just 10 incidents or controversies to make realise that the reclassification of Pluto wasn’t anything new. termed it ‘The Georgian Planet’. English sky almanacs listed it this way for decades, but needless to say it was not a popular convention outside of England. Other suggestion made were to name it after Herschel, or call it Neptune(!). The final decision was not made until 1850 to name the planet Uranus. calculations as to where it could be found). Once discovered, La Verrier wanted to name the planet after himself. To support this naming convention, France released almanacs that listed Neptune as La Verrier and Uranus as Herschel. This did not placate England (who felt that their astronomer, Adams, deserved credit – more on that later) much less the rest of the astronomy world. The name Neptune was suggested, and Laverrier as a planet name lasted only a short time (Georgian Planet, however, lingered). “I feel your pain, Pluto”. in 1801 and was quickly classified as a planet. But less than a year later more asteroids were discovered and classifying them all as planets was problematic. It took a while for the convention ‘asteroid’ to be accepted and Ceres was listed as a planet for decades. Now with the new classification of Dwarf Planet, Ceres has been promoted from an asteroid to a Dwarf planet as it fits all the criteria given for that designation. motion (where the planets go backwards in the night sky because of the motion of the earth around the sun) and appeared motionless. Galileo considered it to be a fixed star and ignored it. His telescope was not good enough to show details that might indicate it was not a star. Centuries later, an examination of his notes and diagrams was done because someone realized that when Galileo was observing Jupiter when it was in Conjunction with Neptune. Sure enough, it turned out that Galileo was the first human to view the distant planet due to some pure luck, but he couldn’t determine what it actually was. caused butting of heads between English and French nationalist astronomers. Finally it was agreed that they would share credit as co-discoverers. However, over a hundred years later, serial credit denier Dennis Rawlins claimed that Adams did not deserve credit for co-discovery as his calculations were way off and almost more harmful than useful (The actual poisition of Neptune was 1 degree from where LaVerrier claimed and 12 degrees from where Adams claimed). It turns out that Rawlins was correct in this case. International astronomers examined the evidence and found Adams should not deserve credit for the discovery. LaVerrier is now considered Neptunes sole discovered. This decision was not made until the late 1990’s. 5) “But, we’re not of Greco-Roman Origin!” The planets are named after Roman gods, which where stolen wholesale from the Greek gods. But Greco-Roman culture did not permeate the entire word. What about Asia? Africa? Native Americans? Indians? Arabs? Well, on the bright planets all of these cultures have their own names. But when it came to the outer planets they were surprisingly clever at adhering to the naming convention. Most cultures, for example, name Neptune after their own historical sea-gods. If they didn’t have a sea-god they would name them after sea monsters. Uranus was a bit trickier as it was a sky god and many cultures do not have such a equivelant diety, so names like ‘Sky King Star’ or ‘Sky God Star’ become the convention. Just get used to me. Vulcan and requested astronomers search for it. Soon after this was proposed many folks started claming to see this theoretical planet either transiting the sun or with direct observation. Most of these observations were unfounded or unreliable, but one done by astronomer Lescarbault was enough to satisfy Laverrier and he announced its discovery in 1860. Many astronomers were skeptical, and there were many false alarms with sunspots being mistaken for Vulcan. But the problem of Mercury’s orbit remained. Laverrier died and the search for Vulcan waned. In 1915 Einstein solved the problem as being an effect of the strong gravitational effect of the sun having a relativistic effect on Mercury that was much diminished on further planets. 3) Canals on Mars: In the later 19th century, several astronomers reporting seeing ‘channels’ or ‘canals’ on the surface of Mars. Some of them were even mapped. It was even suggested that these channels were artificially dug canals that showed intelligent life on the red planet. As telescope optics improved it was noted that reports of canals dropped off. It turns out that seeing canals on Mars was actually an optical illusion that was an artifact of lower-grade optics. A few adherents stuck with these old canal reports until Mariner 4 mapped the martian surface and showed no such features. I’m not Planet X, but I have a heart! orbital issue. When Pluto was discovered it was hoped that it was the answer, but Pluto turned out to be too small. Several other searches for Planet X were made but turned up nothing. Some crazies got a hold of the idea and imagined it was doing ludicrous things like hiding behind the Hale-Bopp comet. Eventually the Planet X hypothesis was abandoned when space probe data revealed the error in Uranus’ orbit was caused by a overestimation of the mass of the planet. Bode’s Law). This was a Law that stated that each planet orbiting the sun will be approximately twice the distance from the previous planet. So Venus will be twice the orbit of Mercury, Earth twice the orbit of Venus, etc. This Law got a boost when it was used to find Ceres, which filled the gap between Mars and Jupiter. Since Ceres was not an impressive planet, some proposed it was actually part of a broken or exploded planet they dubbed Phaeton (and idea still suggested by pseudo-scientists today). The discovery of more asteroids lent hope to this idea, but the total mass of the asteroids later found was not enough to make a ‘real’ planet. Bode’s Law got a boost with having an approximate location of Uranus, but flopped badly when used for predicting Neptune’s location. The Law is now obviously discredited. Telescope Technology – why it seems so far behind sometimes? Every now and then we get someone asking the question ‘Why can’t a computerized telescope do ‘x’?’ Usually ‘x’ is ‘find things in the night sky without me having to work at it’. The answer, as is often the case, is complex. When computerized telescopes first started being mass marketed (many computer systems existed as add-ons or on high-end telescopes and as early as the 80’s) they general impression given by their marketing was that they did everything for you. No aligning the finder, no two star alignment system. Just toss the telescope onto the grass lawn and start watching. This was pretty much a lie, and many folks soured on telescopes as a result. The marketing tried to be a bit more clear as other companies added different computer options, but what most folks wanted auto-alignment and tracking. So what went wrong? GPS companies, smartphone manufacturers, Pad manufacturers all have one thing in common: They aren’t small companies. Apple is a mutli-billion dollar company, Google (who developed the droid system) isn’t exactly poor, Samsung, LG, etc. Even when these companies are having hard times they aren’t exactly small. And they spend tons of money trying to stay on top. Telescope comapnies, by comparison, are on the smaller side. A telescope company that has more than 100 employees is probably a bit bloated. Development and engineering crews are probably in the single digits, with some outside contractors being hired as needed. So this means telescope manufacturers aren’t going to have bleeding edge tech to work on and with. Even when they do get a good idea, it can take a long time to develop & bring to the market. And it will probably use up a large amount of the research budget. An example would be Celestron’s SkyProdigy series, which while it would have been much more expensive to develop 10 years ago was still probably not an easy developement cycle. And this bleeding edge tech does not ensure success. The SkyProdigy is fairly expensive (smaller models were dropped some time ago), and may not work as well as claimed. The thing is, almost all of us carry some kind of cell phone, if not a smartphone so the market is huge (even then some phone makers have embarrassing failures). But with telescopes the market is limited, there is no ability to take loss leads on the telescopes becuase the customer will subscribe to an astronomy plan. If a product comes on the market it needs to earn its way in sales and margins. Pretty much all computer guided or controlled telescopes include some sort of hand-controller. This usually connects with an ethernet cable to the telescope itself. No problem, ethernet cable is still well in use, even in an age of everything being wireless. But suppose you want to run the telescope from your laptop using a planetarium program like Starry Night or something? You’d need a cable to run that, sure, but what kind? You’d probably think some kind of USB cable, and probably one of the bigger sizes like USB. Nope. Odds are you have to connect to your laptop using a RS232 cable. That’s right, old pin and socket tech from the 90’s. These are connection systems that started to go out of style in computer design with the introduction of the first iMac and yet even some of the most modern of telescopes has this connector. Keep in mind that laptops got rid of this connector as soon as they could (pin connections are a big space waster). Even on less computer gadget features, inconveniences can rule the day. Most reflector telescopes designed after 1999 usually have easy-to-handle knobs on the back of the optical tube for aiding in collimating the telescope’s mirror. These knobs are convenient, have a nice grip, and are much easier to turn. But here is the back of a computerized telescope that, while modern in design, uses an off-the-shelf tube that has an older screw-based collimation system.